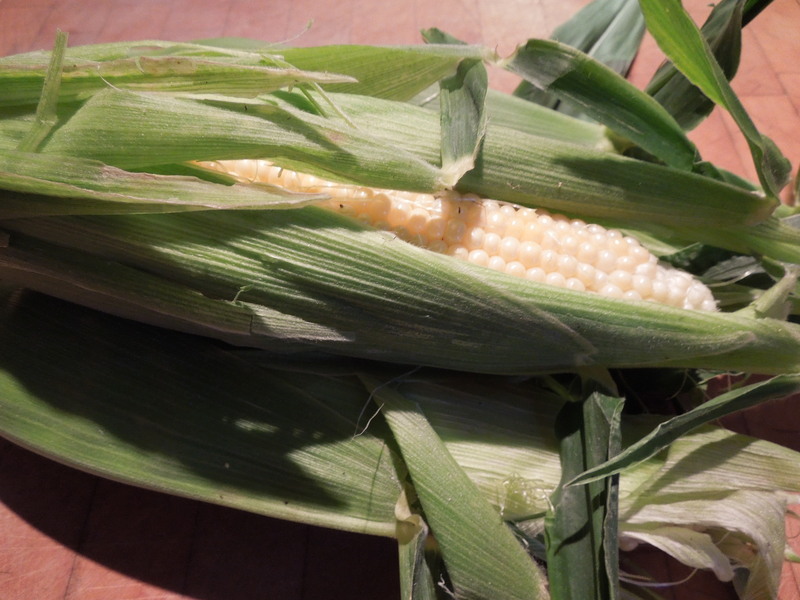 The first corn of the season is so good, so juicy, tender, sweet and delicious that it would be a crime to fool around with it too much. Our favourite way of eating it at the moment is to barbecue it, still wrapped in its green sleeve of leaves. I don’t bother stripping off the silk in advance, it comes off easily enough with the leaves when the corn is cooked, which takes upwards of 15 minutes in a medium hot barbecue. If the corn is fresh from the garden, you can put it straight on the barbie as it is. If you’ve bought it from a shop or farmers’ market, it’s probably a good idea to soak it in cold water for half an hour first. When it’s cooked to your satisfaction, just strip back the leaves and silky threads and drench the cobs with melted butter. If butter isn’t your thing, try dipping a halved lime in sea salt and rubbing that over the corn – it’s a great combo. When we’ve gorged enough on corn on the cob (is that even possible?) 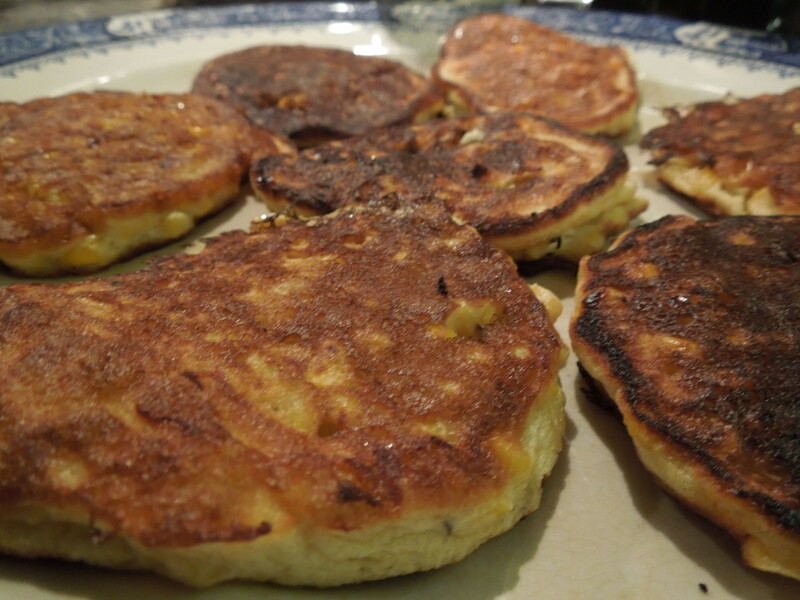 we sometimes make corn fritters or corn pudding, neither of which you should even contemplate if you’re on a diet, but delicious if you feel like throwing caution to the winds. 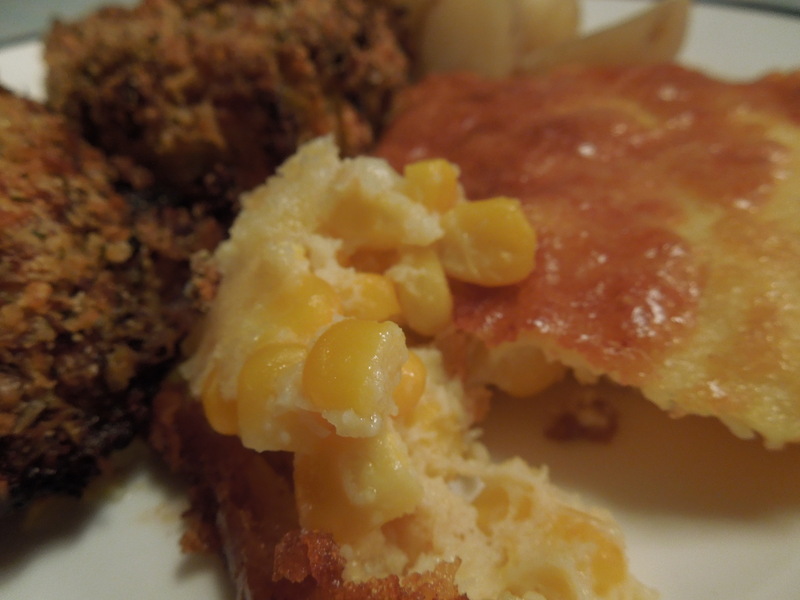 These are also good ways to use up frozen corn you may have hanging around later in the year. 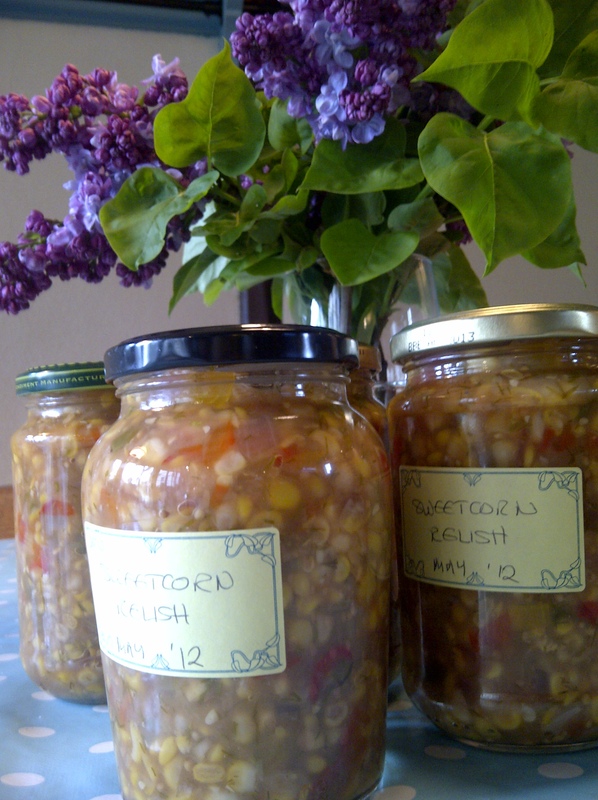 And then there’s corn relish – a lovely way of preserving the garden bounty and scrumptious with burgers, steaks or cold cuts. 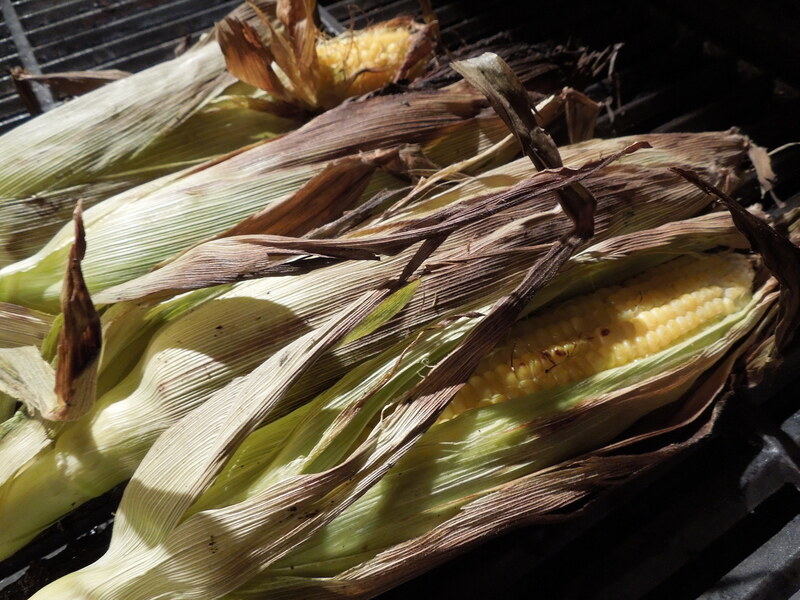 Sweetcorn, of course, originated in the Americas – and so do these recipes. It makes me almost forgive our transatlantic cousins for words like “hospitalization”. 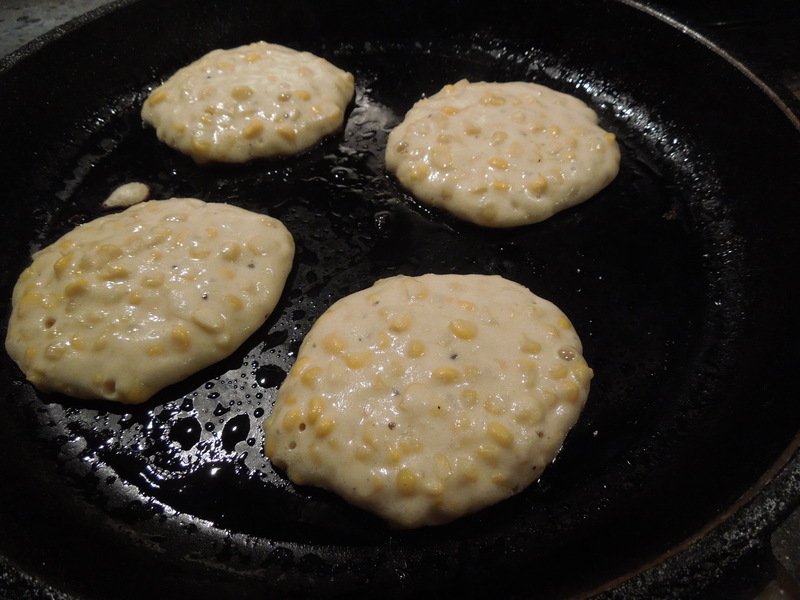 Strip the corn from the cobs and mix with the lightly beaten eggs yolks, flour and seasoning. 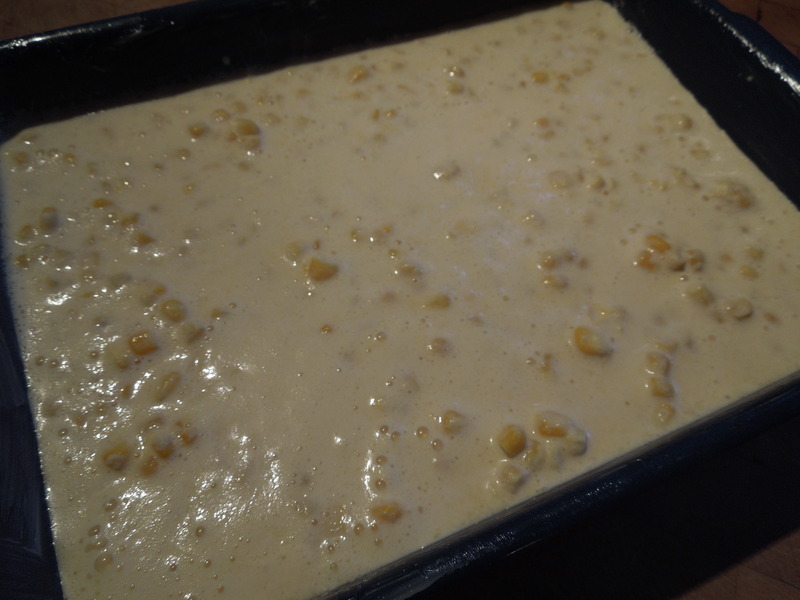 Beat the egg whites until stiff but not dry and fold gently into the corn mixture. Heat 30g butter or veg oil in a frying pan over a high heat. Drop in the batter, a heaped tablespoon at a time. Reduce heat to medium and cook until browned on the bottom, 2-3 minutes. 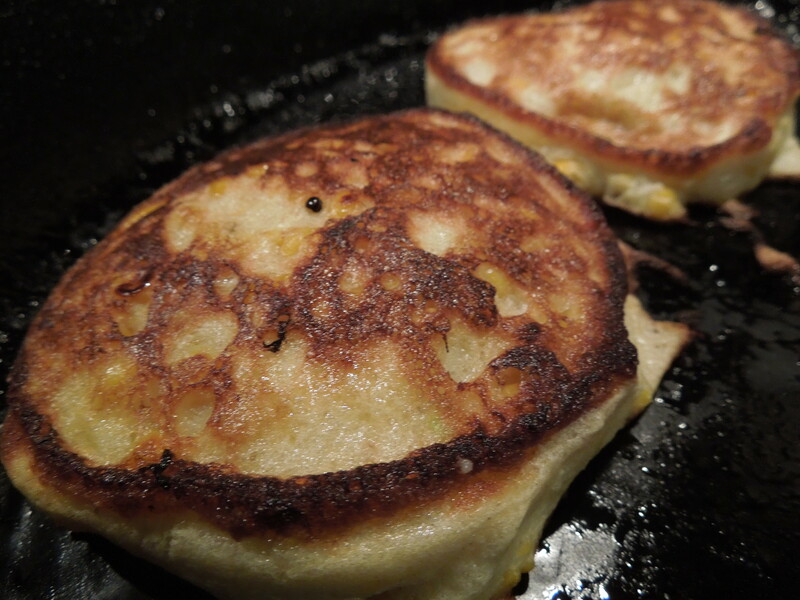 Turn once (don’t pat the fritters down) and cook the second side until browned. Don’t overcook. This is a recipe which was given to me by Carol Cassedy of Whitestone Organic Farm, Bagdad, Kentucky, back in 2003. She cooked it for me and my colleague Ollie and I’m ashamed to say I was elbowing her children out of the way when it came to seconds. NB: uses US cup measures. I have given metric equivalents. This serves 8-10 as a side dish. These pictures show half quantities. Heat oven to 350F/180C/Gas 5. 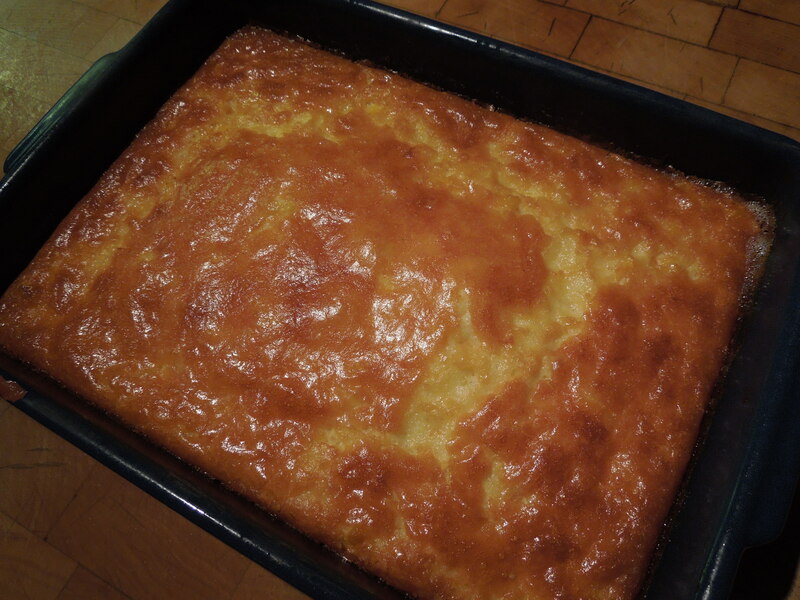 Combine flour, baking powder, salt and (if using) the sugar. Beat the eggs in a large bowl and stir in the whipping cream and melted butter. Gradually add the flour mixture, stirring until smooth. 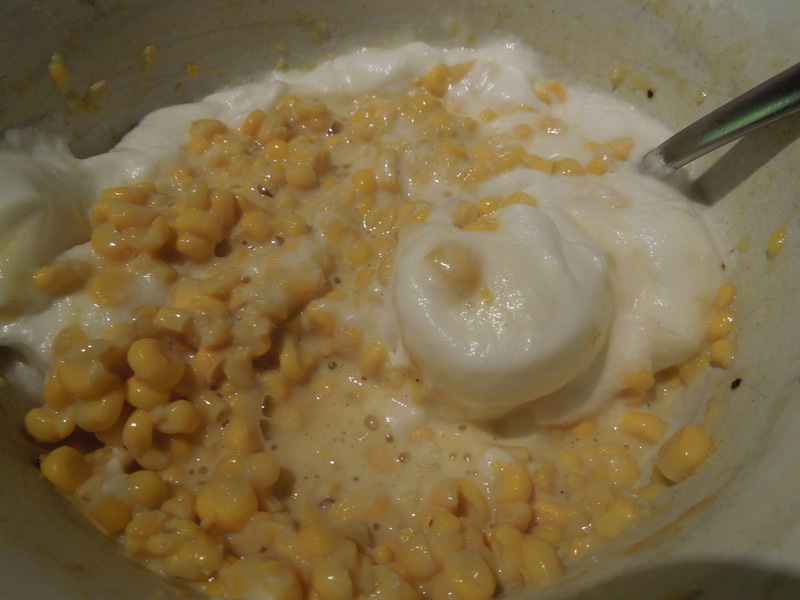 Mix in the sweetcorn. Pour into a lightly greased baking dish and bake for 45 minutes or until set and coloured a deep gold. Let it stand for five minutes before serving. Dice the onions, celery and peppers to about the same size as the corn kernels. In a non-reactive pan, bring all the ingredients to a boil, keeping back half of the dill to add at the end. 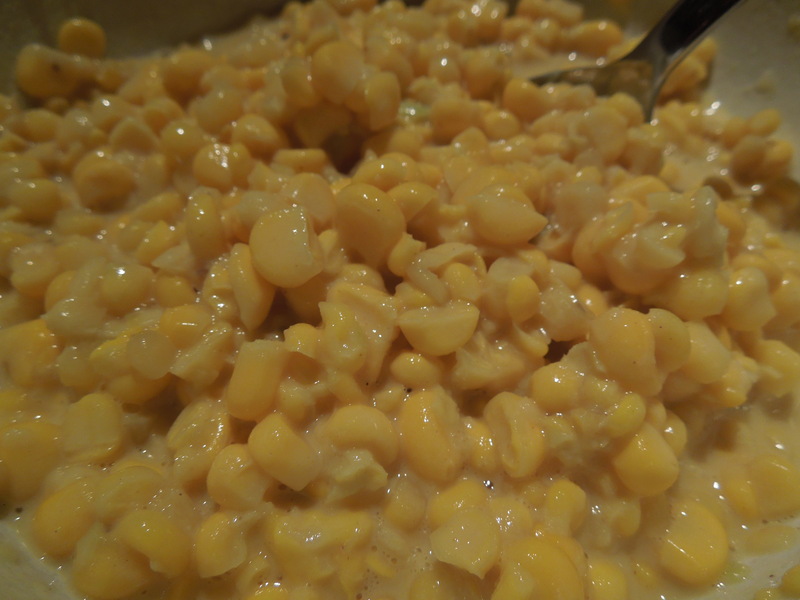 Reduce the heat and simmer until the corn is tender and the sauce is thick. If it doesn’t thicken, use a tablespoon of cornflour dissolved in a little water but make sure you cook off the taste of the flour by simmering for another five minutes or so. Pack into sterilised jars, ensuring the vegetables are covered by the sauce. Seal. You can eat it straight away but it improves with keeping. 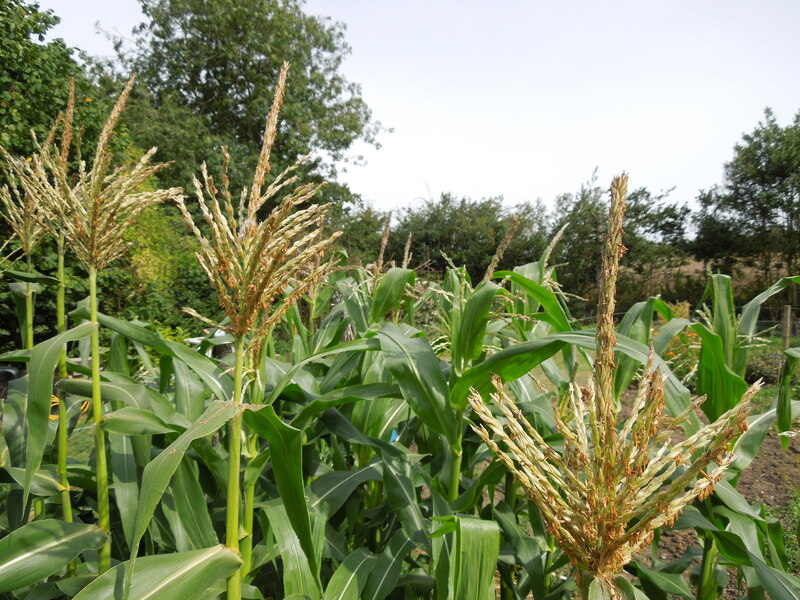 This entry was posted in In the garden, Jams and jellies, pickles and preserves, Vegetables and salads, Vegetarian and tagged barbecued corn, corn fritters, corn on the cob, corn pudding, sweetcorn, sweetcorn relish by Linda Duffin. Bookmark the permalink. That corn looks amazing. Barbecued is superb and I will try the lime/salt thing (though I could bathe in melted butter). I have never once required hospitalization after eating corn. I thought long and hard about how to respond to that, Nick, and decided to settle for a well-brought-up thank you. Apologies to anyone who looked at the previous version of the sweetcorn relish recipe – I made some errors in the ingredients list. I’ve now amended it.